GREAT HOLIDAY HOME. PERFECT GROUND FLOOR ACCESS FOR MUM, WHO HAS PARKINSON'S .THANKS FOR A GREAT VACATION. Set on Beach Road in the picturesque fishing village of Johnshaven, Seashore House is a fully furnished, well-equipped holiday villa situated only a few feet from the shoreline. The villa faces south east and offers spectacular panoramic views out across the North Sea and along the coast towards Montrose. Accommodating up to five people, this comfortable property provides well for self catering family groups. We welcome well behaved pets too. Johnshaven is an ideal family holiday destination throughout the year. Located around 7miles north of Montrose on the A92, the village is in the heart of the South Aberdeenshire coastal region and within easy access of a range of activities; from nature and heritage trails to castles and stately home visits. Within Johnshaven itself, visitors can find true relaxation in a welcoming and friendly community. 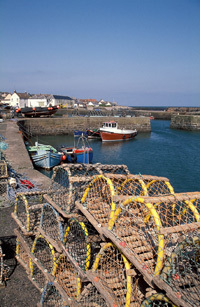 Take a stroll down to the harbour, watch the small fishing boats land their catch and sample fresh lobster from Scotland's largest shellfish merchant.